Daniel Joseph Garcia was born on April 12, 1980 in Riverside, California. He was a star infielder at Peperdine, University getting signed by the New York Mets in the fifth round of the 2001 draft. On July 12th he arrived at Keyspan Park in Brooklyn to play for the Mets A ball team, the Cyclones. In just 15 games played there he was outstanding with his defense & batted .321 as well. He was promoted to Capitol City & hit over .300 there in 30 games played. In 2002 he spent the entire season with the St. Lucie Mets playing second & a bit of shortstop. In 2003 he quickly got off to a .333 start at Binghamton & was promoted to AAA Norfolk. On September 1st he got the call up to the Mets & became the first Cyclone player to make the big leagues. He singled in his first career at bat & would get two hits in the game, a 3-1 Mets win at Shea against Atlanta. In his next game he had a sac hit earning his first career RBI. 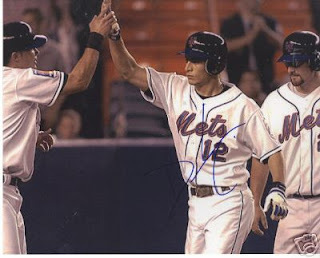 On September 10th, he hit his first career HR at Shea Stadium against the Florida Marlins & two days later hit another, in Montreal. It was a first inning two run shot off Javier Vazquez, helping New York to a 5-4 win. He hit .214 on the season & made four errors at second base playing in 17 games. He began the 2004 season with AAA Norfolk but was called back up to the Mets at the end of April, remaining through early June. Garcia returned in August & in his third game hit a three run HR, driving in four runs in his biggest big league game. That season he played 58 games, mostly at second base, batting .232 with 3 HRs 7 doubles & 17 RBIs. In the winter of 2005 he was released by the Mets & never made it back to the majors. He was signed by the Cleveland Indians but was later released. Honors: He had his uniform number 6 hung on the wall at the Brooklyn Cyclones ball park in honor of his making it to the major leagues. 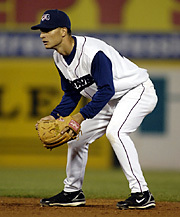 In 2007 he played ball with the Somerset Patriots of the Independent league.